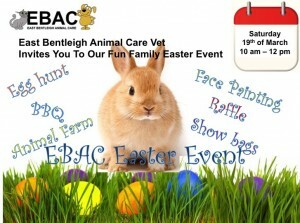 Our First Fun Free Event for 2016 | East Bentleigh Animal Care. As many of you know we love hosting fun events at EBAC to engage with our community and as a thank-you to our clients. Our first fun free event for 2016 will be just before Easter on Saturday March the 19th from 10:00 AM to 12:00 PM. Yes, Easter is coming early this year and we thought there would be no better way to celebrate it than with our free Easter Family Event the week before Easter. Just so we can plan for the number of people coming, please click on this registration link (click here) to register your details and we will send you a reminder a couple of days before the event.